I noticed the other day that the odometer on HamiltonChronicles.com crossed over 1 million page views. 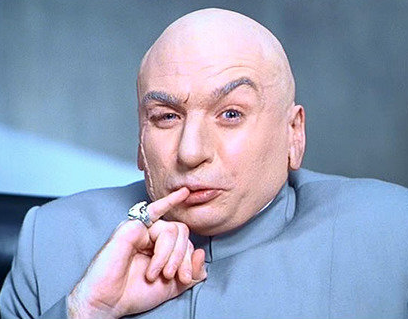 1 million is a cool milestone and exemplifies why I chose the name for the site. Every watch I restore is a step on a journey and milestones along the way reassure me that progress is being made. With each watch I post, I move that much closer toward eventually posting them all. I'm more than halfway there, believe it not. Taking yet another step on the journey, I recently landed a watch that I've pursued without success on many occasions. It's a 1951 Brent. The model was made for two years and in 1952 it became the "Brent B" since it got the newly introduced 19 jewel 753 movement. The 1951 version used the 19 jewel 982 grade. The Brent looks a lot like several other models from the period. It has a classic Hamilton design and echoes models like the Cedric, Barry, Medford and quite a few others. One of the things that make the Brent unique is it has a gabled, or faceted, crystal with a line that separates the top half from the bottom half. It's an interesting look but it's also a bit distracting because it creates a prism-like effect as the light is bent when it passes through the varying angles. 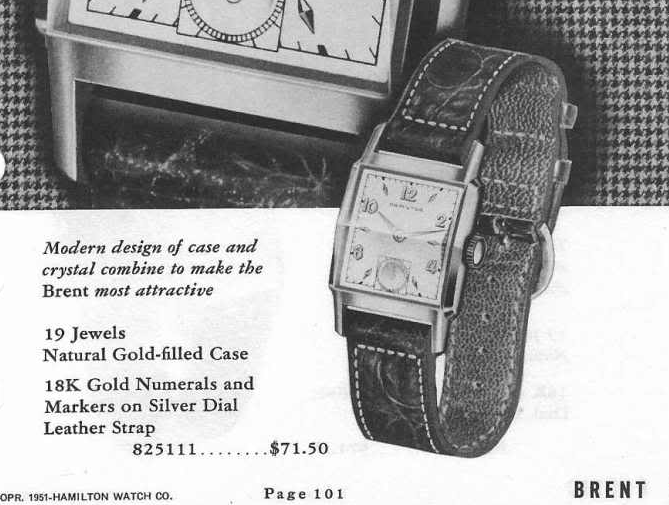 The case is 14K gold filled, so the Brent has the 19 jewel movement... either 982 or 753, depending on the year. The 10K gold filled models typically received the 17 jewel grades, the 980 or 752, respectively. The sterling silver butler-finished dial has solid 18K yellow gold numerals and diamond-shaped markers. For some reason the Brent always sells at a premium so it has taken me a while to land one. They're not rare but they're not very common either. However, just like a blind squirrel finds an acorn every now and again, I was able to score a Brent in need of a little TLC. The crystal on my project watch is beat up and the crispness of the facet isn't pronounced. You can see the line where the light bends on the photo above, crossing from the 8 to the 4. In the photo below you can see how the crystal gables from top to bottom. Without the crystal and bezel in the way, the dial appears to be original and in better-than-fair condition. Its not perfect but it's definitely not in need of restoring. The 982 is a high quality movement and highly damascened. The 980's at this time were also engraved but the 982 and 982M especially so. It's a lot of extra work considering the watch owner would probably never see it - but that's one of the many reasons why Hamilton was the premier American brand. There's no problem identifying this model - it's stamped right into the case back. If this had a 12/0 sized 753 movement it would say Brent-B. I have found that 90% of the 14/0 movements I work on have set mainsprings. This example is no exception, so I'll replace it with a fresh Dynavar white alloy spring. With a fresh mainspring the watch will likely run 40 hours or more on a full wind. If you're lucky, you can often just pop the new spring out of the holder and directly into the barrel. I don't tend to be that lucky though so I just remove them and use my mainspring winder - I have much better success that way and can make sure the T on the end of the spring goes into the hole of the barrel. I bought a new crystal for the watch and it's gabled... but it's gabled across the top to bottom and not side to side. So even though it fits, it's not quite correct. I'll install it anyway, since it's better than what the watch arrived with. Everything is cleaned and dried... well, almost everything. I couldn't find the escape wheel cap jewel for the train bridge. It vanished somewhere during the "clean, rinse and rinse" process. Losing a part now and then goes with the territory when it comes to vintage watches. I know it's not just me, as it's not unusual to work on a movement that has one screw different than the others, or missing altogether, indicating that a past watchmaker lost a part along the way. I'm a graduate of the watchmaking school of "hard knocks". The tuition to the school is about 200 broken movements of varying grades. Each broken movement is a lesson but I have an impressive stockpile of parts for when something like a cap jewel goes missing. As luck would have it, I found the cap jewel. It miraculously appeared with all the other parts - despite my searching for it. As you can see below - it's very small and the screw that holds secures it is even smaller, a true marvel to behold and always makes me wonder, "how did they make such things"? I'll bet one pound of material could make every 982 train bridge cap jewel screw ever made. The movement is reassembled and purring like a kitten. You can see the gold cap jewel in the train bridge below. The cap jewel on both ends of the escape wheel is what makes a 19 jewel 982 different than a 17 jewel 980. Nothing to complain about with this movement... no adjustments required. A fresh lizard strap completes the restoration and the new crystal looks like it was meant to be there. I may still try to find the correct style but I prefer this look over the prism-effect of the original design. Just for fun, here's another shot from a different angle. It's hard to see the effect of the gabled crystal but if you look really closely you can see the 2 in the 12 is really thick, there appears to be two second hands and there are two L's in Hamilton. The good thing about crystals like this is they stand so proud of the bezel that the case is well-protected from wear. Congratulations on the one MILLION mark! And thank you for all the careful, concise blogging! Very nice post. Recently inherited a Brent from my grandfather, in slightly better condition than this one. I was wondering if I could ask some questions with regards to the possible restoration of the watch. Mainly, what would be a fair cost for a cleaning and overhaul similar to what you did? And I found a new old stock original crystal for sale for $20, is that a good price? And I should avoid working on this watch myself since I have no experience, right? Thanks in advance. You can get an overhaul done for less than $100. $20 for the correct crystal is fine. Working on it yourself would be a huge mistake. Watch movements are unforgiving. You can certainly learn how to do it but you're not likely to be successful on your very first try. Thank you so much for your reply! I figured that an amateur touching the internals would be a major mistake, but the research I've done into my watch has actually sparked my interest in the hobby/trade. I may look into further learning and maybe a less valuable first practice piece. One last round of questions; where might I look to find a local or willing repair person? Would shipping it to someone be the best choice? Shot in the dark, would you be interested? You can look at the AWCI.com website for watchmakers that might be in your area. Or you can send me an email or contact me through my Etsy shop and I can give you some recommendations.